Criteo’s analysis of Cyber Monday 2017 shopping data reflects a healthy economy, the shift to online sales and the resurgence of retailers like Walmart, Best Buy, Macy’s and Target. For the first time, US retailers showed just how much they could increase sales through omnichannel tactics and use the power of their retail footprints to their full advantage. 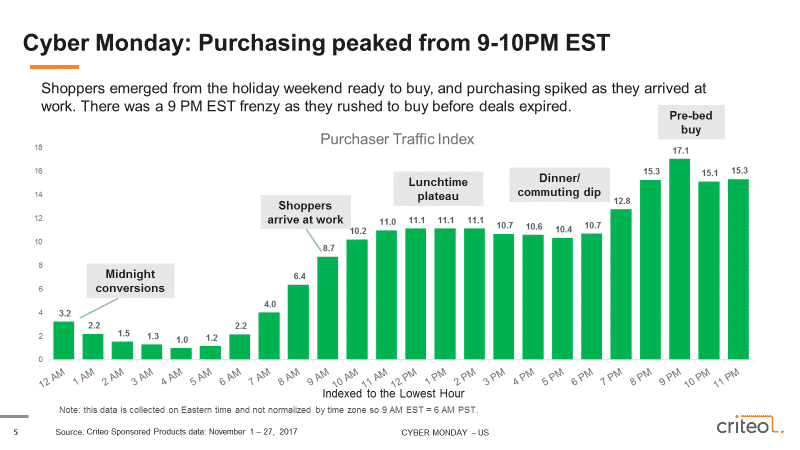 Criteo’s Cyber Monday 2017 shopping data comes from paid search on retail sites (Sponsored Products) on the above retailers plus others that had a key role in the success of Cyber Week 2017: Kohl’s, Kmart, Wayfair, JC Penney, Sears, Costco, Toys ‘R Us and more. This will go down as the year that mobile commerce was fully harnessed by retailers. A host of factors contributed: responsive design now being the norm (so web pages rendered properly on all devices), auto fill for payments, carts made persistent no matter what device the shopper was using (start a cart at on your laptop at home, but call up that same cart on your phone when you are in store), and more sophisticated shopper graphs. Mobile commerce hit a high on Thanksgiving. 44% of all transactions were mobile as shoppers used their phones to buy no matter where they happened to be – just not in front of a laptop. It remained high during the weekend. With retailers like Best Buy, Crate & Barrel and Toys R Us encouraging shoppers to buy from tablets within the store – and on their phones – shoppers had a better experience and register lines never thwarted conversions. When shoppers got back to work Monday, mobile commerce actually experienced a slight dip as shoppers turned to their computers. This was when only a third of transactions were completed on mobile phones. Would people really buy a TV or gaming system on their phone? Of course they would: they had pre-shopped in store or at home and if a deal was expiring, they were ready to “click to ship” or “click & collect” during the week. The average price for an item bought on Cyber Monday was exactly the same: $50. People stocked up on electronics: more items per cart increased total cart value by $27, with an average cart size of $158. In Criteo’s global survey of 9,000+ shoppers, The Shopper Story, we found that omnishopping is the new normal. Shoppers are buying across channels on multiple devices and we can see that trend clearly from our Cyber Monday data. The successful retailers this season are the businesses enabled shoppers to buy where and when they wanted. See the report below!